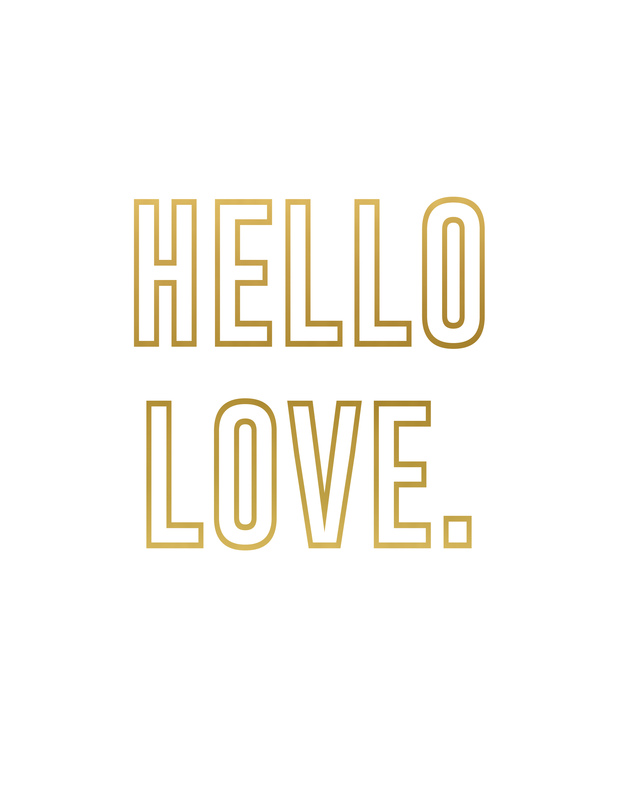 I'm really excited to be announcing and sharing a new blog series! I am so smitten with home décor and putting a home together that I wanted to take you on a house tour...of my entire home, just not all at once. For the next several months I'll be taking you room through room of home sweet home. And along the way I'll be sharing how we find pieces that work together on a budget. Okay, now you can pretend right that you've just rung my doorbell and I'm taking you around my home with a cup of coffee in hand. Instead of starting with a room you might enter right away when coming into someone's home, I'm revealing a huge room makeover first. Last September I shared the 'before' photos of our home office. It was bare and in need of some TLC. After months of pulling design ideas together and making furniture decisions that were budget-friendly, we finally finished our home office just a couple of weeks ago. Having that project off our to-do list feels so good. It's now a place we spend a lot of time together; usually I'm blogging and husband is finishing up graduate school work. And we're really looking forward to early summer morning reading sessions in this room. I like to think that we've turned our once cold office into a comfy and eclectic space that's full of light. This is the view from the door. Immediately you're greeted with light pouring in through our double windows. Before our furniture was dark brown, and it really made the room feel dull. A fresh can of white spray paint on the desk really made all of the difference. From there we ordered a new filing cabinet and bookcases, both in white. We both knew we wanted a place to sit in our office outside of sitting at the desk. These IKEA chairs were the perfect addition to our room. Again their white, and while that might seem a little crazy for a chair, it really helps lighten the room up. I'm telling you, the more white the better! Plus, you give yourself a canvas to invite all kinds of bold colors into the room in accents. We knew we wanted to draw more natural tones into the room, so when I saw this table and its matching friend at Target, I knew right away where they belonged. 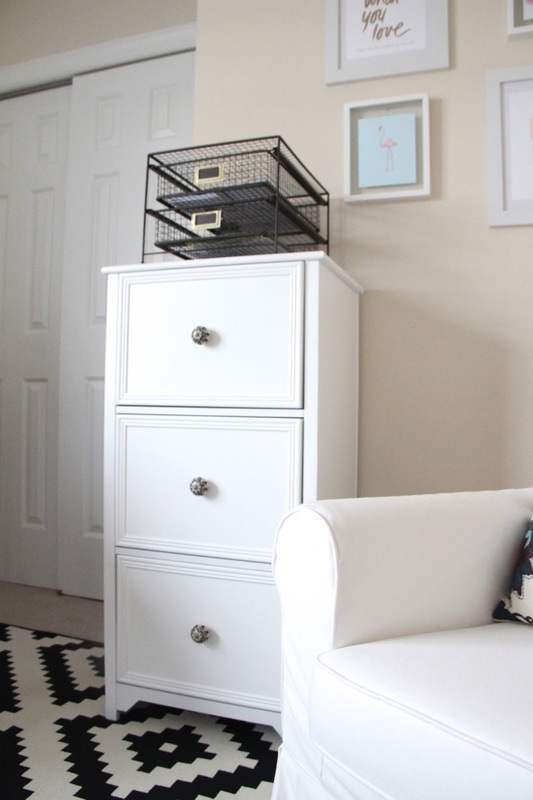 This side table turned out to be the perfect contrast to the white chairs. I told you we were using the white as a blank canvas, and that left room for some really fun accents. Like this IKEA rug and pouf! The rug really brings such a different vibe to this room than it originally had. The pouf is one we found at Target on clearance (as were several other items in this room). To the right of the desk you can see the natural wood side table that matches the accent table from above. We needed a place to hold our printer, and this table was it! The drawers makes storage for the printer paper. When we first had a filing cabinet, it was a DIY project that husband and I worked on. It served us well, until it just became too big. This go around we wanted a filing system that would take up less room. This particular filing unit fit the bill. 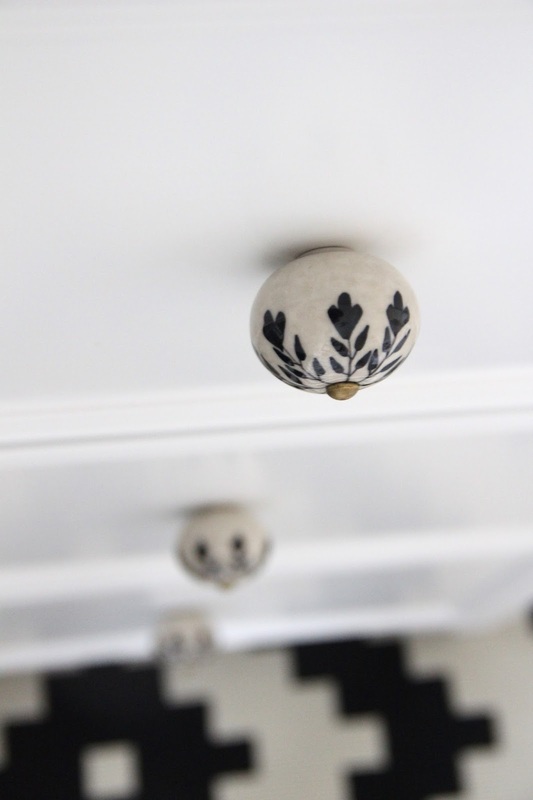 And to make it feel more like a custom piece, I switched out the knobs it came with for these simple, but sweet knobs that I found on clearance at Pier1! And I even put one of these knobs on the desk drawer to give those two pieces (from two different places) some unity! I'm a sucker for art and photos on the walls. Originally I had photos up in two of these frames, along with some text in the other two. It was nothing I loved. So I went digging around the internet to see if I could find some art that would not only go well in this room, but was free. And boy did I ever find it! Keep scrolling because at the end of this post I share where you can find it too! Wall art really makes a lot of difference in a space. You can create a theme just in photo frames! With the new look, meant a new desk chair. Mostly because the one we had was from my college days and offered no support. This one was right on budget and fit the look and style we were going for. Target for the win, my friends! In my search for free wall art, I found the cutest calendars. Yes, for free! With a little resizing when I was ready to print, the original 8x10 calendar shrunk down just like I needed it to to fit my 4x6 photo frame. I love when you can find an creative way to display something that might otherwise be boring. p.s. the curtains were a clearance find at Target. $7.48 for each panel! Target's end-of-aisle is where it's at! Every desk needs some accessories. It wasn't hard to put together some of my favorite pieces to give the desk a little theme. I love a well laid out work space, and the desktop is key. It's important for me to have it clutter free, while still feeling like 'me' and creating some organization. There are so many favorites in this office. One of which is the bookcase that husband and I decided on. It's an IKEA set, and we couldn't be happier. With the theme of the room, obviously white was a must. But we also knew that short bookcases were going to make this room feel open, compared to tall, almost-entirely-up-the-wall bookcases. It didn't hurt that they were at a price we couldn't beat! Another new feature to this wall is husband's diploma frame. It's coming up on three years since he graduated and it was finally time that we get his frame and take his diploma out of the envelope. It finally completes the wall. I think we should call this our scholar wall, what not with the diplomas and books. I love fun and bright plants. This bookshelf isn't just for books, but for pretty accents too. As I see an accent I can't live without, I'l collect it and use it on these shelves (at least until they're full of books) and on top. The cactuses provided the pop of color we wanted, and they're low maintenance, which is good for this not so green thumb. 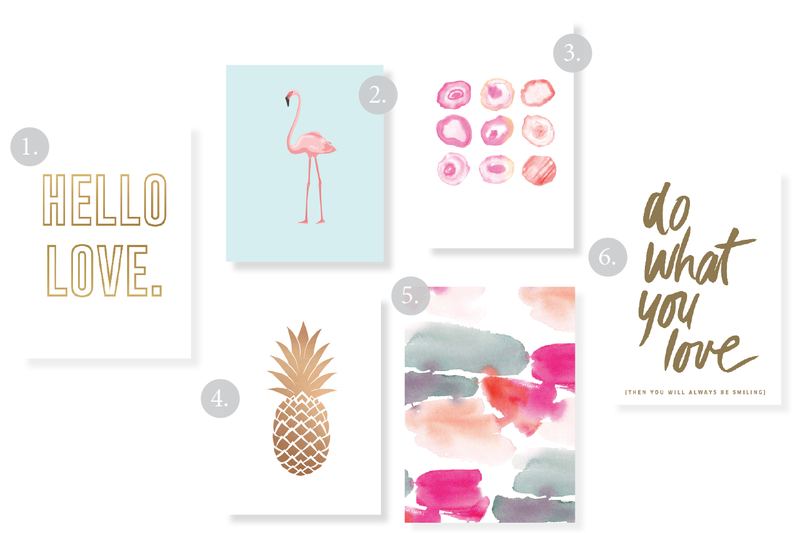 Now one of my favorite parts of this post...sharing with you where I found all of my free wall art! I know I'm so thankful that others share their talents with us at no expense. 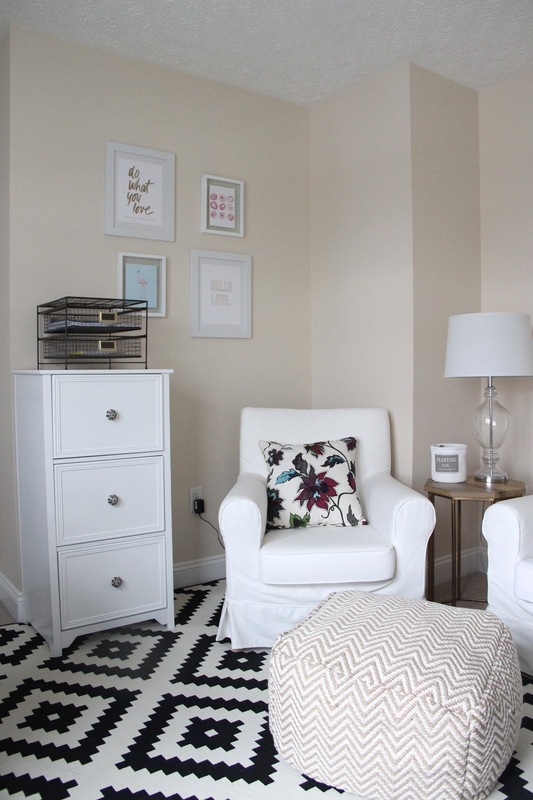 It really makes finishing up a space, not a cringe-worthy, budget-rearranging saga! So what are your techniques for decorating a space. Or how do you best keep your office space organized? I'd love to know!